The CASA RAAB "experience" includes visits to traditional markets, museums, handicraft villages, ancient ruins, and Oaxaca's fabulous restaurants, churches and art galleries. The Casa Raab estate is 40 acres in size and offers safe hiking and exploration of creeks, caves, mineral springs, an onyx mine, and our maguey (agave) plantation. Morning and evening walks on the land or in the village offer cultural tranquility with outstanding views. We offer assistance in planning all aspects of your trip. Meals are wonderful, the mezcal is made on site and "world class", and a frequent open mike musical venue happens here at the Casa. The on-site US owner/managers can help arrange professional touring services. We specialize in "transportation solutions". Our Mexican staff will give you a warm and friendly welcome. They supply comfortable service, information, and hospitality in a light-hearted manner. Traditional Oaxacan meals are available twice a day, with housekeeping and laundry services cheerfully provided. The Casa Grande(4 bed/4 bath) can serve up to 8 adults or 10 if it's a mix of adults and children. There is a total of 6 beds with room for one additional single. Larger groups can add La Casita (2 bed/1 bath) for a total of 14 guests. (See La Casita listing). The main dining room can seat and serve up to 14 people. Both houses have access to the swimming pool. Internet is available throughout the compound. An extensive DVD-VHS movie library is available as well as a nice selection of books. Our family began the Oaxacan adventure when I (Anthony) was 15 years old. I have been coming to, and working in, Oaxaca ever since. I have been in the import-export business with Oaxacan handicrafts much of my life. My wife Rebecca and I now live on the family estate on a full time basis. Casa Raab was begun by my parents in 1965, so for us it is a happy 2nd Generation decision. Generally, though, it is the Climate and Weather! People who settle here from other places are primarily convinced to live here because it is so nice outside most of the time. Houses are designed so that less time is spent indoors, and more out on the patio. Eleven months of the year you don't need interior heating nor cooling...especially when staying in our adobe-walled houses. Of course Culture, Art, Food and Music also have major impacts on most Oaxacan decisions. Whether it is a large group of friends & family, or just a traveler or two, Casa Raab offers a unique experience of the Oaxacan countryside. This is a true village atmosphere, complete with some primitive adobe dwellings, a town square and small herds of animals on the street occasionally. We are just minutes away from modern Mexican society, but on our property it is quiet, peaceful and beautiful. A certain timeless feeling is in the air. Visiting the city and doing all the "tourist activities" can be demanding, and it is always nice to retreat back to Casa Raab for an evening meal and a quiet night's sleep. All bathrooms are finished with traditional tile surfaces and local artwork. Daily cleaning by the maids. 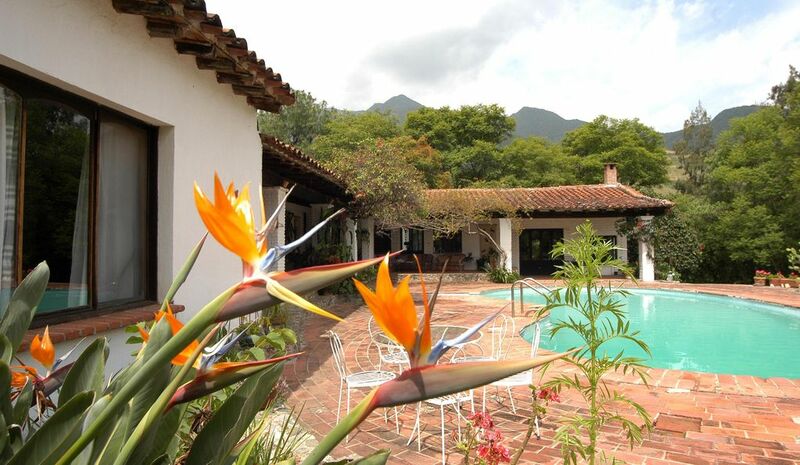 Casa Raab is located in the foothills in a village setting. Everywhere you go is a different view or "campesino" cultural experience....much different from being in the city. Our village of San Pablo Etla is set at the base of its own extensive forest lands....bordering on the Federal Forest extending towards the Carribean. The Casa Raab Estate covers 40 acres, and the views are outstanding...of both the mountains and the valley below. A local phone is available at the bar. Best to bring your cell phone for convenience and long distance. Great coverage in most areas. Great climate that needs little interior help. Rooms are cleaned and beds made daily in Casa Grande. Every other day in la Casita. Sheets are changed weekly. The washing machine and dryer are in our separate laundry facility. Most clothes washing is done for you by our staff. The dryer is also in our Laundry facility. Good WiFi coverage across the entire facility. Casa Grande living room is large and can handle most groups.....including special events that spill out onto the patio. Deluxe Kitchen in the Casa Grande and a full kitchen in La Casita. Nice selection of cds. Best to bring your IPod and plug it in. 500 carefully picked VHS movie classics for your evening enjoyment, or to keep the kids happy. Gardens are set up throughout the facility. No bikes at present...but mountain biking tours are available. The patio of the Casa Grande wraps around the pool. There are also other private courtyards and patios. 9 hole course 20 minutes away. The various steps are low, and one person can usually push/pull a loaded wheelchair up or down them. The Casa Grande surrounds the pool. Solar heated, but generally cool. La Casita guests have reasonable access to the pool, while respecting the privacy of guests in the Casa Grande. We host everyone from individuals to large reunion groups....with 40 Acres in the Foothills for Hiking. Housekeeping, Cooking and Laundry Services. Pets usually allowed. Handicap Friendly. Child Friendly. Safe and Delicious Oaxacan or American Meals. Full Wet Bar with our estate distilled Mezcal. Fireplaces, Games, Movies, Library. Animal Rescue Program, Agave Plantation with a Traditional Mezcal Still...and more! Visit Local Markets for culture and fascinating experiences. Tour Ancient Ruins for trips into the past. Go for Guided Bird watching or informal looks on the property. Attend Language or Cooking Schools. Go on Handicraft Village Tours & personally guided Mezcal Tours. And of course spend some time in Oaxaca's Famous Zocalo (town square), with its wonderful restaurants and museums.